Since 1990, Lifewater (LI) and Lifewater Kenya (LWKE) have worked in partnership to help eradicate the water and sanitation crisis in Nakuru District, in the Rift Valley Province of Western Kenya. 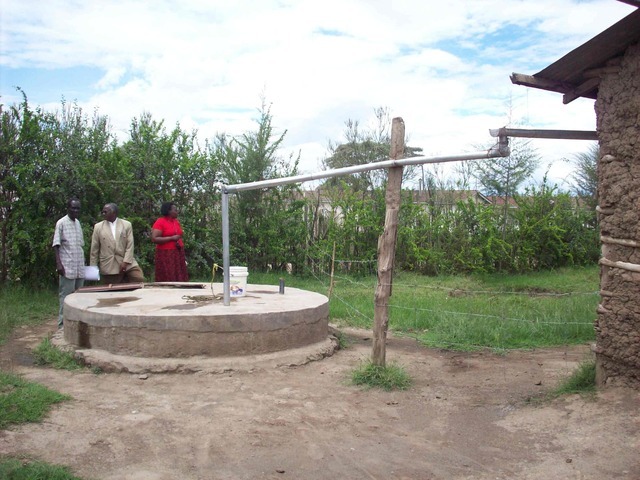 Many of the schools in peri-urban and urban areas of Nakuru do not have access to safe water or adequate sanitation. In addition to the obvious serious health consequences, the lack of safe water poses particularly difficult challenges for women and girls. For example, at Ndarugu Primary School 27 female teachers share 1 latrine while more than 700 female students share a mere 8 latrines. This is a staggering 88 students per latrine, more than 3 times the Kenyan Government standard of 25 girls per latrine. Severe diseases are associated with a lack of water and poor sanitation, including diarrhea, dehydration, trachoma, dysentery, and skin infections. These same diseases are responsible for the deaths of thousands of impoverished children each year. The economic consequences of these diseases and deaths are a ripple effect: women must take care of the sick instead of attending to the fields, leading to poor diets and reduced income. Adolescent girls generally avoid school during their menstrual periods or when they are ill, leading to high absenteeism and low educational attainment. All of these factors conspire only to deepen poverty in the target areas. The WASH program is an initiative to save lives and reduce suffering by providing safe drinking water, sanitation and hygiene education to people who lack these basic services; Lifewater International and Lifewater Kenya aim at doing exactly that. Providing access to sufficient quantities of safe water, the provision of facilities for a sanitary disposal of excreta, and introducing sound hygiene behaviors are of capital importance to reducing the burden of disease caused by these risk factors. A recent hygiene intervention study shows that diarrhea disease transmission in rural areas is reduced by promotion of safe drinking water, hand-washing, and dish-washing behavior. Based on recent visits to the proposed schools and data collected by the implementing partner, the project methodology of layering infrastructure development with investments in the intellectual capacity of beneficiary communities will yield tangible and quantifiable dividends. Install water tanks at each school, providing a safe water supply for students during the school day. Currently, the two schools are plagued by unreliable and often completely unavailable safe water supplies which are not adequate for both drinking and washing of classrooms and toilets; this forces children to bring more water from home, exacerbating an already critical water situation in surrounding communities. 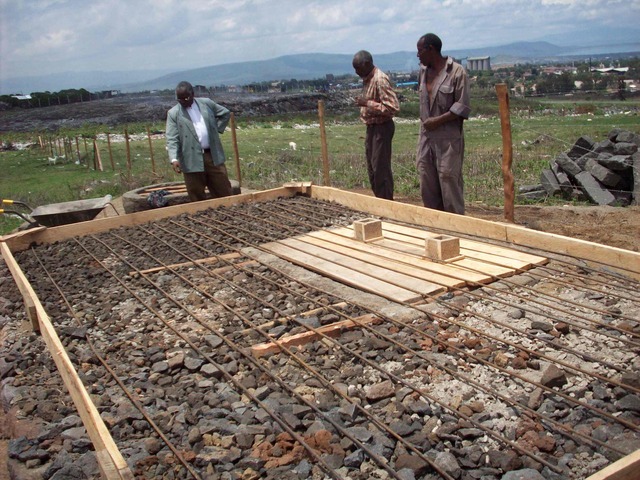 Construct an appropriate number of student latrines for students at each school. This number is determined by commonly held minimum standards based on gender. The project will target a ratio of 25 girls per door and 30 boys per door, plus one urinal facility. Construct latrines for teachers at Ndarugu School, ensuring that teachers are empowered to adhere to class times and uphold professional standards, as well as their dignity. Install hand wash stations at each school, sited appropriately near latrine blocks to facilitate good hygiene behaviors. The project-supported student WASH clubs will be responsible for conveying to their schoolmates the importance of hand washing at critical times and its relevance to community and personal health. To ensure the sustainability and proper maintenance of these improvements, the project will support the development and promotion of health clubs within the 2 target schools. These clubs are comprised of student members with an appropriate gender balance, and facilitated by a teacher advisor. In addition to providing leadership to the student body and input to school directors on the management and maintenance of the latrines and water supply, student WASH clubs also provide a valuable investment in their student members. By investing in these students to become agents of change, both in their schools and in their communities, the project sends an important message to them that they are valuable members of society. Additional WASH training for teachers, provided through separate funding, will further consolidate the gains made through this project, ensuring future integration of WASH principles in the school curriculum. •Most children are eager to learn. Schools can stimulate and support positive behavioral change in children. •Children have important roles in household chores related to hygiene. •Children may question existing practices in the household and become agents of change within their families and communities. •Children are future parents. What they learn at school is likely to be passed on their own children. The implementing partner will meet all government requirements for permitting and permissions. In addition, government agencies/officials will be invited to view the completed project as a model for future government interventiions. Initial program ownership rests with school leaders in collaboration with school WASH clubs. Future success will be achieved through expanded hygiene training and materials, which will be integrated into the school curriculum. Drawing these linkages will help students and their families understand the importance of handwashing at critical times, good sanitation practices, keeping water safe with regard to health and well being. In addition to this project, other initiatives (current and planned) allow continued engagement in these schools. A comprehensive budget spreadsheet is attached. It is nearly impossible to assess a value for projected community contributions, which may include components such as unskilled labor donation, sand, rocks, or beverages for construction crews. This looks like a great project, but I have a few questions / clarifications. 1. Like Boda Boda Initiatives, I am also interested to know about your water supply. There are very few details regarding this. What is the water source, and how will reliability of this source be insured? How far is the water source from the tanks, and how will this water be transported? 2. I am also interested to know about your sustainability mechanisms. You mention no ongoing maintenance costs. How will occasional repairs and general maintenance be met? Will this be covered by the school- is there a plan in place to ensure they have the necessary funds to cover maintenance costs? 3. In relation to sustainability; the number of latrines and size of water tanks, has this been calculated for the current school population or a projected future population? If this is for current school population, how long do you envisage this number to be adequate for? Are there any mechanisms in place to build extra facilities when needed in the future? Hi Joe, Thank you very much for reviewing our proposal. Perhaps some of the very insightful questions you raise have been answered above, but allow us to elaborate on the point of filling the tanks. When rains are available, the tanks will be efficient at capturing this resource with the aim of lowering dependency on the municipal water source. When this is not an option, the tanks will be plumbed, either temporarily or permanently, for legal and authorized connection to that source. Our in-country partner will liaise with local authorities and school administrators to ensure that any necessary permits and permissions are in place. Of course, as with any water system, there are ongoing maintenance costs. With respect to this particular RFF we did not list any because the larger project, which this is a part of, will address this issue. Apologies for not making that more clear. The plan is that community WASH committees and student WASH clubs would be trained in routine maintenance and repairs, enough that many issues could be addressed at the community level. In addition the larger project will evaluate the feasibility of micro-payments by beneficiaries which would then broadly be used sustain these schemes. This is an important element of community engagement and especially highlights the importance of a well-trained and engaged WASH committee. The ratio of students to latrines is based on a minimum standard enacted by authorities in Kenya. The issue of projected future population is a difficult one in any case – right now we can only build based upon the data as it exists today, but the intent is that communities and schools are equipped to not only properly maintain the facilities but also recognize when they are inadequate for the population they serve. In most cases any pit latrine has a finite lifespan, though this can be maximized with regular maintenance and appropriate use. Here again we see the importance of solid community engagement in a project of this nature. If we can clarify further please let us know. Welcome to a new way of working in the water sector - seems you are liking it! Could you please clarify the numbers on the application. When we talk about # of people getting water and sanitation, we refer to systems that provide households so that the people have it 'for life'. School projects that provide water during school days only come under a different count - the school children count (including staff). So if the community does not get access to the facilities after school or non-school days, the numbers should be zero. Was at Lake Nakuru a few months ago and would have loved to see the site, before. It is possible to get images, quotes, interviews before, during and after project? I see no photos from the site on the application, it would be great to have your Kenyan office help in creating as complete and compelling an application as possible. Finally, for funding and management purposes can we consider these two projects separately? Is there some overlap, synergy that is not mentioned? Indeed this is a very innovative approach and we are enjoying the dialogue. Agreed, the primary beneficiaries are students in the school which as we know are measured differently than the “for life” that generally applies to community-based projects. We had some very long discussions about how, and in fact whether or not, to measure the community benefit in this project. Ultimately we decided to consider the students’ home communities as indirect beneficiaries, for a number of reasons including the alleviation of some burden on the water supplies at home. Additionally we felt this was appropriate because the project aims to increase healthy hygiene behaviors and equip teachers and students with knowledge of how they can protect their health through these behaviors. In aggregate we felt that through this type of service provision,education and empowerment communities would also benefit. It is possible that we will have the scope of photos you mention, indeed that is our plan. Senior staff from Lifewater and our in-country partner were recently in Nakuru and had an opportunity to visit two of the schools in the larger project. Due to schedule limitations on this particular visit they did not see the two schools named in this proposal, though our staff have in the recent past visited all of them and our in-country partner is in frequent contact with leadership at each. We have uploaded photos that can serve as interim “before and after” examples. Note that the “before” picture is of a school designated to benefit from the larger project. Which leads me to your next point, yes there is tremendous overlap as the infrastructure developments we propose here are underpinned by training, administrative support, and community engagement in the larger project. Each school can be considered individually or in tandem with the others, but let us again point out that the scope of this project goes beyond what is presented here; we wanted to ask for an amount that made sense based on the published funding ceiling and goals. This segmented approach actually works well with our funding strategy, which gives us a high degree of flexibility wherein we can seek relatively small amounts of funding from a variety of sources, either on a per-school or per-component within a school basis, and combine them under one management structure for maximum efficiency. This also allows a full scope of donor participation – from the family that can only afford a $200 gift to the foundation that can afford $20,000. We like to think this creates a unique community of donors as well. Can you please explain the line items in your spreadsheet regarding "2 Doors" "16 Doors" and "10 Doors"? Sure! That just means the number of actual latrine units per block. So, for example, if we say 16 doors it would be one building with 8 stalls, or doors, on each side. Don’t you see that is very important for the NGO to work with Government by involving Government officials /Technicians during project implementation and evaluation rather than inviting them to view completed project? Most definitely, we do see that. Generally our experience is that this can be a key component of capacity building, and from similar projects in other countries we have learned that government involvement is not only essential but can also be beneficial, particularly with regard to sustainability. Above and beyond bureaucratic necessities such as permitting and licensing, meaningful interaction with government is vital to a program such as this. By engaging and cooperating with relevant government stakeholders every step of the way we encourage replication and dialogue. Government stakeholders in this case would include local and national officials and government workers from education, environment/natural resources, and health sectors. Congratulations Lifewater for planning to install water tanks in two schools thus providing a safe water supply for students during the school day as well as building latrines and hand wash stations in Nakuru. •	We have noted that the two schools are plagued by unreliable and often completely unavailable safe water supplies which are not adequate for both drinking and washing of classrooms and toilets which forces children to bring more water from home, exacerbating an already critical water situation in surrounding communities. Please explain the source of water to be poured into the water tanks. Are you going to do rain harvesting? If so have you made a provision for that in your budget?You have written about hand water stations near the toilets which will obviously be far away from the water tank. Are you going to provide water pipes and water taps? Where is it in the budget? •	What sort of tanks are you building? •	What sort of latrines are you constructing? •	How do you do monitoring and evaluation to asses the impact of your water programs? •	The community contribution have to be factored in to show community participation and ownership, otherwise the project will surely fail. Hi Beatrice, thank you for your questions. We are very happy to have the opportunity for dialogue in this way, and confident that we can all learn something from the discussion. For this project the tanks will be filled through rain harvesting, and when there are no rains the tanks can be filled by the municipal water source, though rationed. This rationing and frequent interruption of service really emphasizes the need for an efficient and effective system to capture rainwater, which is what the project will construct in partnership with the local community. We have shown comprehensive costs for this system, including a 10,000 gallon water tank. The planned handwashing stations are not envisioned as permanent, plumbed water points. Rather they are meant to be easily replicable, doing double duty as learning tools which the students are able to recreate at home for family use as well. These “tippy taps” will be filled daily by the students, either by the classes or by the health club members. The larger project budget includes training and support for a student WASH club and the teachers. The tanks will be masonry, constructed based on a well established and field tested model. Likewise the latrines will be pit latrines with stone lining in the pit itself, a masonry wall superstructure, and iron sheet roofing. Monitoring and evaluation will be based on community involvement at the outset and built on solid relationships. Data and evidence, as well as ideas for improvement and lessons learned, will primarily occur through observation and interviews with the children, teachers and parents. Reports will be compiled by project staff through regular contact with beneficiary communities. You are absolutely right that community contributions are essential to the project’s success. From the outset, parents and other community members will be expected to provide labor and some locally available materials. Beyond that, the program includes an ongoing dialogue with communities and the schools, including appropriate training and awareness campaigns. Maintenance and sustainability are dependent on community engagement at the learning and implementation stages, all of which is included in the larger plan. Thank you very much for allowing us to clarify these important points. The tanks that will be masonry are, I presume Ferro cement tanks? Have you found that they are most cost effective than using the pre-fabricated plastic tanks? Thanks! The tanks that will be masonry are, I presume Ferro cement tanks? Have you found that they are most cost effective than using the pre-fabricated plastic tanks? The combined rainwater harvesting, hygiene and sanitation approach for these schools is very simple and should have immediate impacts. The rainwater harvesting strategy is great for this area where other water sources are hard to find. I have seen similar projects implemented in Kenya and they serve a very specific population and are very effective on this small scale. Good luck with the implementation and I look forward to seeing the outcomes! It is not very clear where the water will come from and relying on rainwater to fill the proposed water tanks is not a viable option,If they can get water from the Municipal mains though rationed the project might be successful. The proposal is solid with a few questions about the volume and sourceof water. Lifewater has built a reputation and on this basis their first application into PWX must be even more strongly supported.